NIU alumnus and high school basketball coach John Harder has scored national recognition this season. USA Today has chosen him as one of the top five coaches in Florida for high school girls basketball and has opened voting to the public to crown the best coach in each state. Fans can visit USA Today through Feb. 24 to choose their favorite coach. State winners and two wild cards will advance to a regional round, followed by regional winners and two wild cards moving on to a national round. Harder was in the news last weekend for his team winning the Class 5A-Region 3 championship game. The Lady Seminoles of Southeast High School in Bradenton, Fla., now head to state and play their first game Friday. He has already won two state titles with the Lady Seminoles and is leading them to state for the fifth time. “It has been 10 years (since the last state game). And it was a rush of joy and satisfaction that came back over me, thinking that there was another chance to go back,” he said. The 65-year-old social studies teacher also made headlines in December when he won his 700th career victory with the Lady Seminoles. 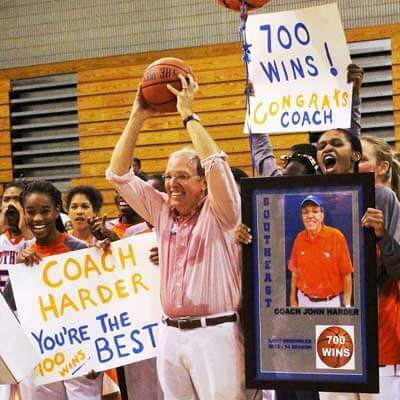 That win made him the 14th coach in Florida high school history to win 700 games. 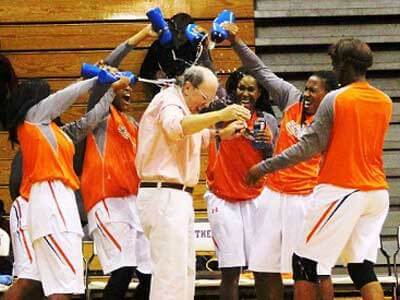 His team continues on a winning streak, with 720 wins, 25 straight victories and a 29-1 record. In his state trophy case, Harder has collected seven basketballs, each recording 100 wins and the signatures of his players. In the 1990s, he achieved a 72-game winning streak that spanned a decade against opponents in Manatee County, Fla.
As one of five public high schools in Bradenton, Southeast is in a tough neighborhood, where children grow up poor, said Harder, a native of Calumet City, Ill. But he can relate to his students and their struggles since he grew up in a blue-collar town. His popularity with the students is evident. For seven straight years, he has been voted the Golden Nole (short for Seminole) by Southeast students for being an outstanding teacher. 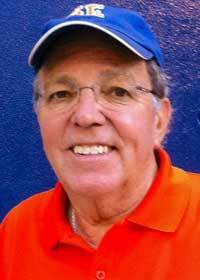 Harder has 40 years of experience as a coach and teacher. Before moving to Florida to coach the Lady Seminoles, he coached high school boys basketball for 10 years in Illinois. He earned a master’s degree in physical education from NIU in 1975 and a bachelor’s degree in social science from Southern Illinois University at Carbondale in 1970. “That master’s degree in education, with a major in PE, and the experience that I had as a student got me where I’m at today,” said Harder, who recalled starting to love basketball during education classes at NIU.